This flight takes us from Edinburgh Airport (EGPH), the capital of Scotland, to Oban (EGEO), a picturesque town on the west coast of Scotland. 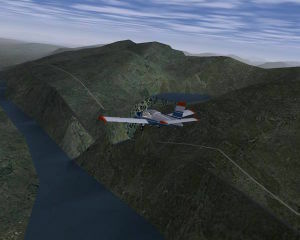 It mirrors a flight I made in real life in my microlight (also known as a trike, flexwing or ultralight) in April 2009. Pictures from the real flight can be found here: . That particular flight actually took off from my home airfield of East Fortune, and took 2 hours at 70mph, but that runway is a bit short for most GA aircraft, and taking off from Edinburgh shortens the flight slightly. For those not using Terrasync, the required scenery is w010n50. The distance between the airports is 75nm (85 statute miles), with an on-course heading of 294 degrees magnetic, which takes you over some very nice scenery. 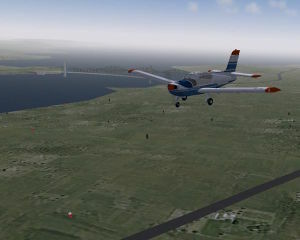 Our flight starts from Edinburgh International Airport (EGPH). 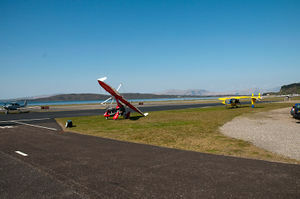 I would suggest using a GA aircraft, as the Oban runway is "only" 1420m long. For example, those using the command line might enter the following. Once you've taken off, head on a course of around 294 degrees magnetic. You will be following the south side of the Firth of Forth (an estuary) and the M9 motorway. Behind you you should be able to see the Forth Road and Rail Bridges. The Rail Bridge is a wonder of Victorian Engineering. 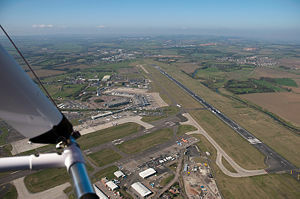 Around 15nm out you will pass over the town of Falkirk, with the oil refinery of Grangemouth to the North. 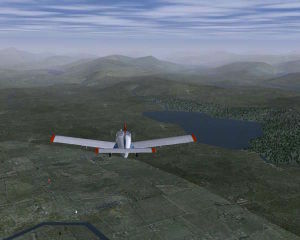 At this point the Forth becomes a river, twisting across the farmland around Stirling to the North of the flight track. Ahead, the mountains begin to rear up with many lochs (Scots word for lake) in the glens (valleys). 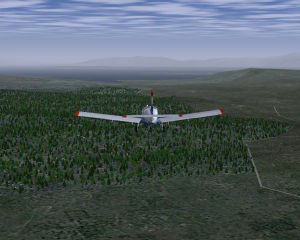 A cruise-climb to 4000ft will take you over them. 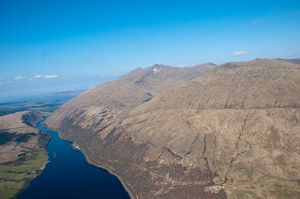 At around 48nm from Edinburgh you will pass the peak of Ben Lomond, and then over the northern end of Loch Lomond, which extends to the south towards the city of Glasgow. You are now only about 25nm from Oban, and after passing another ridge of high mountains, the land begins to drop towards the West. 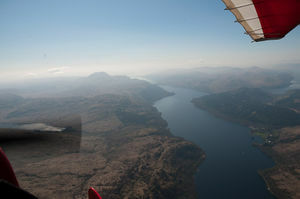 You can now start descending to 2000ft as you reach Loch Awe. Immediately North is the mountain of Ben Cruachan, with a hydro-electric dam high in a corrie on its side. With 10 miles to run, the airport should soon be in view, with the sea behind it. 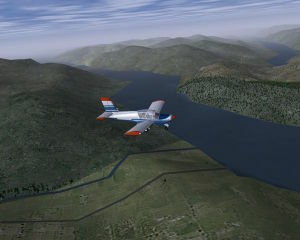 Those wanting to extend their flight can explore the picturesque West Coast of Scotland from Oban. This page was last modified on 4 July 2015, at 15:27.